Full stack with whipped cream. French toast topped with strawberries. Two hotcakes and two bacon or two sausage links and two eggs, any style. Our belgian waffle served with your choice of 5 chicken wings, 4 chicken tenders or 1/2 deep-fried chicken, a dusting of maple syrup, butter and powdered sugar. Tortilla filled with two eggs scrambled with cheese, country sausage, mels potatoes and a touch of country gravy. Come with a side of sour cream and salsa. Two eggs with corn tortillas, shredded jack and cheddar cheese and topped with avocado, ranchero sauce and sour cream. Served with refried beans. 6 oz. New York steak and two eggs. Housemade with bell peppers and onions. Served with fresh fruit and toast. Fried steak and two eggs. Three farm-fresh scrambled eggs with authentic chorizo. Served with refried beans topped with cheese, sour cream, fanned avocado, a sprinkle of green onions, salsa and corn tortillas. Almost a pound of thick sliced ham, served on our large platter with two eggs and all the usual suspects. Three fresh eggs, ground beef, mels seasoning salt, fresh mushrooms and spinach scrambled with green onions and topped with parmesan cheese. Served with toast. Breakfast sandwich with two scrambled eggs and your choice of bacon, ham or country sausage and American cheese, served on grilled, thick sourdough bread. 2 pancakes, 2 eggs, 2 strips of bacon, 1 country sausage and ham with hash browns or mels potatoes. Made with chicken, apples, and sun dried tomatoes with two eggs. Served with toast. Scrambled eggs with authentic chorizo, green onion and ripe tomato with cheese stuffed into a large, flour tortilla and served with sliced jalapenos on the side. A large, grilled flour tortilla stuffed with smoked bacon, scrambled eggs, tomato, avocado and cheese. Served with a side of salsa. Bacon and Ortega chiles scrambled with eggs and topped with avocado and melted cheese. Served with salsa and sour cream on the side. Mels potatoes with authentic chorizo, tomato, green onion and melted cheese. Topped with two, farm-fresh eggs any style, sliced fresh avocado and a dollop of sour cream. Served with corn tortillas or toast. Ham, bell peppers, onions and tomatoes, scrambled with eggs and topped with mixed cheese. A combination of scrambled eggs, diced country sausage, link sausage and bacon, all covered with melted mixed cheese and our country gravy. We cover your choice of potatoes with two biscuits, two country sausages and country gravy and top it with two eggs any style. Choice of potatoes, two biscuits, two sausage links, two pieces of bacon and ham steak. Smothered in country gravy and topped with three eggs, any style. Three-egg omelette stuffed with ham, grilled peppers, onions and cheese mix. Served with hash browns or mels potatoes and toast. Mels famous chili with jack and cheddar cheese. Sauteed onion, bell pepper, tomato and sizzling chicken breast topped with guacamole. Choose from country ham, sausage or bacon with jack and cheddar cheese. Three-egg omelette stuffed with Mels seasoned taco meat, Ortega chiles, diced tomato, chopped green onion, ranchero sauce, melted jack cheese and sour cream. A blend of jack and cheddar cheese, green onions, sliced avocado, sauteed mushrooms, tomato and sour cream. Our big, three-egg omelette stuffed with tomato, bacon, cheese and sliced avocado, topped with a dollop of sour cream. Egg whites with Swiss cheese, fresh sauteed mushrooms, diced tomato, avocado and fresh spinach. Served with fresh fruit instead of potatoes. With your choice of ham, sliced avocado or country sausage on a grilled English muffin, topped with poached eggs and hollandaise sauce. Grilled English muffin halves topped with three strips of bacon, grilled tomato slices, avocado, poached eggs and topped with hollandaise sauce. Grilled English muffin halves topped with sliced tomato, fresh spinach, poached eggs and topped with hollandaise sauce. Two eggs, three sausage or three pieces of bacon. Three eggs with choice of four pieces of bacon or four sausage links. Two eggs with choice of country sausage, hamburger patty or ham steak. One egg, two sausages or two strips of bacon. Chicken strips, onion rings, mozzarella sticks, zucchini sticks and chicken wings on a bed of melfries with ranch dressing and marinara sauce. 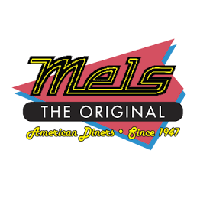 Mels original or try them with Buffalo sauce. Served with ranch. Wings on a bed of melfries. Sweet Spanish onions fried crispy. Served with your choice of ranch or BBQ sauce on a bed of melfries. Jack and cheddar cheese with green onion, tomato, guacamole, salsa and sour cream on a flour tortilla. On a large, whole wheat tortilla with jack and cheddar cheese, zucchini, sauteed mushrooms, tomatoes and onions. Battered, fried and served with marinara sauce. Served with cheddar and jack cheese and chopped onions. Our seasoned melfries topped with our brown gravy. With mixed jack and cheddar. Melfries covered with chopped bacon, melted jack and cheddar cheeses, diced green onions and a dollop of sour cream. Caramel, chocolate, banana, oreo and malt powder. Oreos with cookie dough ice cream. With cornbread, melted cheddar cheese and onion. An original mels favorite julienne strips of turkey, ham, cheese and hard-boiled egg over a bed of greens. Served with your choice of bleu cheese, thousand Island or ranch. Breast of chicken, red and green peppers and sauteed onions, served over a bed of greens with salsa, guacamole and sour cream. Fresh diced tomatoes, crumbled bacon sliced hard- boiled egg and shredded jack and cheddar cheese on a bed of crispy lettuce and topped with crispy sliced chicken or buffalo-style chicken dipped in our hot wing sauce. Crispy corn tortilla with chips topped with mels seasoned taco meat, refried beans, shredded lettuce, diced tomatoes, jack and cheddar cheese, diced green onions, a dollop of sour cream and guacamole. Lettuce, chopped bacon, diced chicken, avocado, scallions, egg, tomato and blue cheese crumbles. Bowl of soup and mels house or caesar salad with corn breed. Half sandwich, mels fries and choice of cup of soup, luncheon salad, fresh-sliced coleslaw, house-made pasta salad or cottage cheese. Sandwich choice: turkey, tuna, ham, roasted beef or pastrami served on grilled sourdough bread. Sliced roasted beef simmered in an just on a french roll. Carved breast of turkey, bacon, lettuce, tomato and mayonnaise on white bread. lettuce and tomato on the side, served on a ham burger bun. Swiss cheese, sliced breast of turkey, two crisp bacon strips and tomato sliced on grilled sourdough. Grilled, tick french bread topped sliced roasted beef, layered cheddar cheese, green chiles and sliced tomato . Beer battered and deep-fried to a golden brown, topped american cheese, coleslaw, mayo, lettuce and tomato, served on a hamburger bun. Served on our ciabatta bread, topped jack cheese, avocado, bacon, lettuce, tomato and mayonnaise. Pastrami or corned beef swiss cheese, sauerkraut and thousand islands dressing on grilled rye. Vegetarian delight iceberg lettuce, tomato, mayonnaise, avocado, muenster cheese, red onion and cucumber. A full quarter pound, 100% all-beef hot dog, sliced and grilled . Served on a steak roll lettuce, tomato, pickles, avocado and sliced onions. Mels hot dog chopped onions and melted cheese. Served open on a grilled french rolls avocada slices, melted jack and cheddar cheese, sliced turkey, sliced tomato and thousands islands dressing. jack, cheddar and american cheese. Aidelles grilled sonoma sausage, jach cheese, red and green bell peppers mixed grilled onion, served on a hamburger bun. Monterey jack, cheddar and american cheese bacon, tomato and onion. A combination of sliced turkey, ham and American cheese stacked a pineapple ring, dipped in egg battered texas toast, deep-fried to a golden brown and sprinkled powered sugar. Classic bacon, lettuce and tomato $8.79 avocado $9.79 over-hard egg $9.59. cheddar cheese and sliced tomato. jack, cheddar and american cheese sliced ham. mayonnaise, lettuce and tomato on rye breaded. lettuce, tomato and mayonnaise. Served on a hamburger bun. This one has it all. Served on our ‘Hoagie Style’ bun with tender-sliced, grilled Sirloin steak topped with sautéed mushrooms, grilled onions and layered with cheese sauce, topped off with jalapeño and pepperoncini. Served With Sliced Tomato, Lettuce, Onion and Thousand Island Dressing $8.99 & With Cheese $9.99. Grilled sourdough bread, a meltburger patty, cheddae cheese , avocado, grilled onion with thousand island dressing. Our melburger covered with thickly sauteed red and green bell peppers with thin slices of onion. We add a slice of melted muenster cheese. Served with a bleu cheese mayonnaise dressing. Beef patty in buffalo sauce, topped with bleu cheese crumbles, deep-fried onion straws, shredded lettuce and tomato. Our classic melburger with cheddar cheese, bacon strips and onion rings topped with barbecue sauce. Draped with cheddar cheese, two strips of bacon, lettuce, tomato and onion, with thousand island dressing. Chedder cheese over our theriyaki glazed pineapple rings, lettuce and tomato on a melburger patty. Grilled hamburger patty on rye bread with cheddar cheese, sauteed onion and tomato slices. Thick, sourdough bread, buttered and grilled with melted swiss cheese and sauteed onion. With chopped onions and melted cheese. Mels turkey burger with mayo, topped with cheddar cheese and slices of bacon on a wheat bun. Served on our whole wheat bun with honet mustered dressing, lettuce, tomato and pickle. Two large beef patties choice of cheese, tomato, lettuce and onion thousand islands dressing. Topped with sliced tomato, jalapenos, lettuce, grilled onions, thousand island dressing and pepper jack cheese. Our chicken breast served with lettuce, tomato, pickle and acreamy mustered sauce served on a wheat bun. Fresh patty on our signature bun, brushed with mayonnaise stacked on top of golden onion straws, draped with swiss cheese and smothered in sauteed mushrooms. Chicken breast with jack cheese, ortega chiles, lettuce, tomato, guacamole and salsa served on a wheat bun. Our chicken breast dressed up with cheddar cheese, strips of bacon, lettuce, tomato and creamy mustard sauce, served on a wheat bun. Mels theriyaki glazed on a grilled chicken breast with chedder and pineapple slices, served on a wheat bun. Served with lettuce, tomato and mayonnaise on a wheat bun. Served on our signature bun with bacon, lettuce, tomato, mayonnaise and onion straws. Served on our signature bun with lettuce, tomato, and onion with a side of mayo. Chicken breast with cheddar cheese, bacon strips, and onion rings topped with BBQ sauce and served on our signature bun. 8 oz. prime rib cut served with four pieces of our golden fried shrimp. 6 oz. NY strip steak with grilled chicken breast smothered in BBQ sauce. 10 oz. rib eye steak with sauteed mushrooms. 10 oz. grilled and smothered with sauteed onions and mushroom gravy. Old-fashioned chicken fried steak topped with country gravy, sauteed mushrooms and choice of biscuit or cornbread. Six pieces of battered golden fried shrimp with a side of cocktail sauce. With dressing and cranberry sauce. Breaded and crisp on the outside, moist and tender inside. 3 pieces of beer-battered cod with tangy tartar sauce. With brown gravy and topped with mushrooms. Tender and juicy, topped with sauteed onions. We pair a delicious 6 oz. New York strip steak and four pieces of our golden fried shrimp for only. Four pieces of our golden fried shrimp with three juicy, deep-fried chicken tenders served with ranch dressing and cocktail sauce. With three pieces of shrimp, two pieces of cod. Pralines and cream ice cream with caramel topping and banana wheels. Two scoops of premium vanilla ice cream, banana wheels. Premium vanilla and praline crunch ice cream layered in caramel and chocolate toppings. Two scoops of premium cookie dough ice cream dusted with Oreo cookie bits and topped with chocolate and caramel topping. Premium vanilla and chocolate ice cream layered in marshmallow and rich chocolate topping. Cola with a scoop of premium vanilla ice cream. Cherry cola with a scoop of premium vanilla ice cream. Root beer blended with premium vanilla ice cream. Coke blended with premium vanilla ice cream. Sprite blended with orange sherbet. A sweet-tart lemony filling topped with light fluffy meringue; a true American tradition. Chocolate, strawberry and vanilla ice cream topped with chocolate, strawberry and pineapple sauces, whipped cream, nuts and cherry on a whole banana. A single scoop with a cookie for the lighter appetite. Choice of two flavors of our premium ice cream, served with cookies. A single scoop of vanilla ice cream, choice of syrup, whipped cream, nuts and a cherry.